I’ve spent the last month considering my colour habits in knitting, specifically my relationship with the colour brown. (Well, I’ve done other things in the last month, too, but you understand). In all my colour selections in the past I’ve tended to avoid brown just as an impulse, because I usually associate it with all the other earthy tones like mustard yellow and rusty orange and reds that veer dangerously close to those first two sorts of shades. I like purples, pinkish reds, teals, and blues, and that’s that. My Cabled Swing Cardi for Rhinebeck was the first point of re-consideration, and as a last-minute Rhinebeck knit I made up a second pair of Maine Morning Mitts in the pink-and-purple-o-riffic shade of Noro Silk Garden #251. And it finally sunk in that brown doesn’t always have to sit next to rusty earth tones, and that perhaps it is actually a pretty nice mix with the purples and reds and teals that I already love. This is my 3rd pair of Jaywalkers in Lorna’s Laces Shepherd Sock (5th pair overall), in the curiously named colourway of “Pilsen”. Whenever I’ve taken them out with me as travel knitting, they’ve received compliments and inquiries about the yarn, which I definitely take as a good sign. If brown can interact with these shades then I’m a fan. It’s not rust, it reminds me of truffles or berries dipped in chocolate, or layer cakes with cream and raspberries piled on top. This is the glove pattern from Patons leaflet #1159, ‘Convertibles, Gloves, and Nordic Mittens’, which I’ve used a few times now and keep going back to because I like the snug use of 3.25mm needles combined with the Patons Classic, and geekily I like the way the thumb gusset is constructed. Sadly I think this is now out of print, but if you ever do come across one of these pattern leaflets I recommend it. I’m combining the shades ‘Petal Pink’ and ‘Chestnut Brown’ by alternating stripes every 3 rows, and so far I couldn’t be happier. And with that, Monday greets me and I must spend some time doing things other than knitting. What’s on your needles for the winter? I love the color combination on the Jaywalkers! I’ve got Christmas knitting and a February Lady Sweater just waiting for a few more repeats until completion! I can help you out with the name “Pilsen” — it’s a neighborhood in Chicago. Many of the Lorna’s Laces colorways are named after neighborhoods, such as Lakeview (my neighborhood, BTW), Ravenswood, etc. Pilsen is now largely Hispanic neighborhood with lots of yummy Mexican restaurants, but it used to be the home of many Czech immigrants. I think it’s a Czech name. Brown can be gorgeous, and I love it mixed with pink and with robin’s egg blue. My needles are busy with holiday presents (scarves and hats), as well as mini hats and mittens for an advent calendar garland. I decided I needed a few warm accessories for the colder months – I’ve got a scarf 3/4 of the way done and just started some gloves (oddly enough in a handpaint with browns and purples together! ), plus my fair isle vest. Plenty to keep me busy! I love the striped gloves! I’m going to have to hunt for that pattern. I’ve got going (or will have very, very shortly) six pairs of Fiber Trends felted clogs (which thankfully fly off the needles), a scarf to felt and another one after that, a wrap, two pairs of fingerless mitts and two sweaters that are well on their way. I actually think I’m going to make it, too! Brown does look nice with mint and pale blue and pink: all the pastels!!! Nice Jaywalkers. Mine have worn out, I must make another pair!! Lovely gloves too. Oh how I yearn for a wall of yarn!! 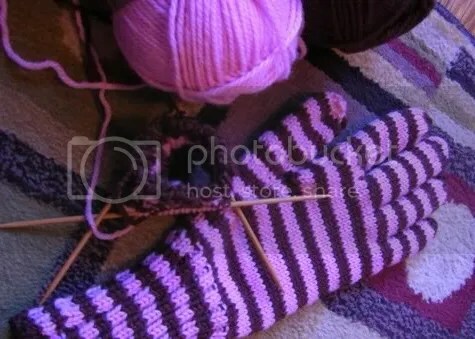 I’ve got socks, fingerless gloves and a sweater on the go….I’ve got a bit of startitis on the go, but I need more yarn to finish the sweater, and the fingerless gloves are a pattern change…..
Lovely socks & gorgeous colors. 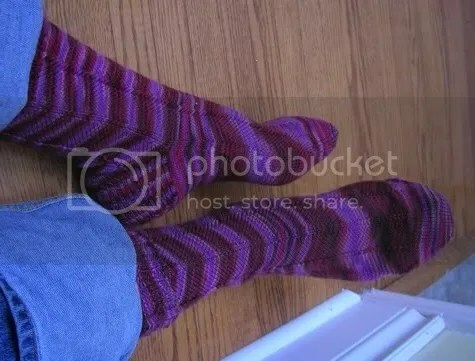 Unfortunately, we are heading into summer, so I am just knitting socks . Those socks are loud! Nothing subtle about those colours. I’ve got a shawl and socks on the needles – started recently for Xmas gifts, and a pair of pulse warmers that were waiting for cooler weather to be needed. You reminded me that I’ve also got an incomplete pair of gloves that I must dig out and finish soon. Plus a cardigan that I got discouraged with last spring and haven’t touched since. And the Manon sweater that had gauge issues. I’ll probably end up starting (and hopefully completing) a few other Christmas presents that I have planned before I finish some of these older projects. Brown is the new black – my fav. neutral! It looks great with that pink, blue is also a fav. “perk up” to brown. I know that I wouldn’t have been caught dead knitting something in pink or green until this year. I’ve finally loosened up in the ‘knitting things for other people’ area, and I’m starting to investigate greens that won’t make me look yellow. For the winter, I have a beaded Adama Shawl, a pair of socks, and an Eiffel that I started out hating, but I think is going to turn out quite well. I also discovered Jorid Linvik and her awesome mitten designs, so hopefully I’ll be tackling a few of those in the next few months. I love pink and brown together. Your jaywalkers look great! I have a holiday gift scarf on the needles and plans to make two pairs of fingerless gloves for gifts. I’m contemplating my next sweater which will be for my husband. I love the colors that you choose. I have been steering away from brown, too, but I think I might work into it — maybe a soft caramel color — after I finish the purple sweater I am working on. I tend to stay in the blue/purple/green family, but it may be time for a change. Your knits look lovely. I am going to try and start Gloria this winter, I might finish it by next then!! I switched to brown from a year’s long love affair with black and then grey. I can’t believe how well it goes with purple and red and citrusy green! I’ve just fallen head over heels in love with Ysolda’s cabled cardi “Vivian” – its going to fill my January! I love brown with pink or purple. Your knits look lovely! Pilsner is (was?) a brand of Czechoslovakian beer.